Playing many games will make you strong? I was shocked to see that because in my experience lots of adults kept playing lots of games and developed their own styles that are mostly common mistakes. I have great respect as some of the best pros, but I didn’t understand why they say that. I decided to investigate what they mean and their experiences. So I read Ootake’s biography and that of Iyama’s. 3. They both were extremely talented Go players. When Ootake was a child, he went to a Go club near his house and played with many adults. But he had a 5dan Go teacher. Many years ago 5dan was worth today’s 7dan or higer. His Go teacher had a very good Go training, so he could teach Ootake not only basics, but also advanced things. Ootake kept learning very good tesuji, shape, etc. from his teacher. Later he became an apprentice of Kitani Minoru 9dan. Iyama also had a good Go teacher. More importantly he was introduced to Ishii Kurnio 9dan pro and played with him many times. Of course, he had proper lessons. Ootake and Iyama had wonderful Go teachers, played lots of games, had reviews from their Go teachers. They also loved Go, so learned everything very quickly. 1. Most adults don’t have very good Go teachers. So they cannot learn proper tesuji, shape, joseki, etc. for a long time. 3. Most adults are not talented Go players like Ootake or Iyama. In my experience it takes adults time to learn one tesuji; it may take a month. That never happened to Ootake or Iyama. They learn one tesuji and could use it in their games immediately, and they never forget it. Also there are lots of children who are not as talented as Ootake or Iyama. There are quite a few children who stops playing Go because they cannot improve quikcly. I’ve recenlty had a conversation with Mimura Tamoyasu 9dan. He runs a Go school for children. Quite a few students at at 20kyu or 10 kyu leave his school because there is not a Go teacher who could teach kids at 20kyu or 10 kyu. 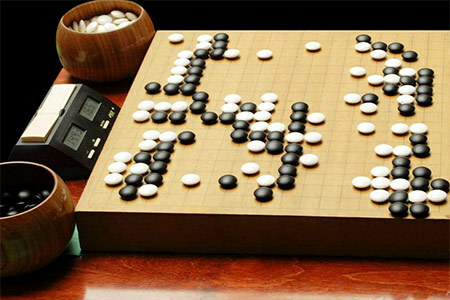 I’ve met quite a few adult Go students at the age of 40s, 50s, 60s who started playing Go in their teenagers in a local Go club (“Gokaisho” in Japanese) and played lots of games, but never learned basics. They were in a Go club where most people kept playing common amateur mistakes, loved killing stones, and never cared about basics. Naturally my adutl students also developed Go with lots of common amateur mistakes. Until they had lessons from me, some of them never even looked at basic Go books. Since their mistakes were ingrained in their mind for many years or decades, it was really hard to get rid of them. Even if they learn basics, their common amateur mistakes always came up when they play a game. I do have great respect for Ootake and Iyama. But considering their experiences as a child, and considering my experience of teacing adults over 15 years, their advice seems to work only for certain talented children who have a good Go teacher. Kellin Pelrine 6d took top honors at the Colorado All-State Go tournament, held March 21st, in Denver. “The inaugural tournament conducted by the Littleton Go Club was a huge success,” said TD Stuart Horowitz. “Thirty players participated in the event, which was sponsored by the Confucius Institute, who graciously provided a lovely venue along with a catered Chinese lunch.” Winner’s report: Dan Section: 1st place Kellin Pelrine (4-0); 2nd place Eric Wainwright (3-1); Upper Kyu Section: 1st place Stanisslav Irisov (4-0); 2nd place tie Kent Evenson (3-1), Christopher Annanie (3-1); Mid/Lower Kyu Section: 1st place Tae Kim (3-0); 2nd place tie Rich Newman (3-1), Akron Amanov (3-1). All winners received go books. -Paul Barchilon. Photo by Laurie Linz. Su Guangyue, a fourth-year law student who had been runner-up in 2013, won the 13th World Students Go Oza Championship, held February 24-25 at the Ginza Internet Forum in Tokyo. The contestants were sixteen university students: ten from the Far East, three from Europe, two from the Americas, and one from Oceania. For the eighth time, the winner was Chinese. The event was organized by the All-Japan Students Go Association, Nikkei Inc., and Pandanet, with the cooperation of the Nihon Kiin and the International Go Federation. The last stage of the Nongshim Cup featured a last men standing showdown between Japan and Korea. The losing side will be out of the competition. Younggil is going to show you a game played between Kim Jiseok 9p and Iyama Yuta 9p from the 16th Nongshim Cup final round. The opening was well balanced, and the middle game fighting was interesting. You can feel both players’ profound reading, and learn how to manage a close game before the end game stage from this video. This week, in lightning speed, #20 to #11 from the list of best tesuji’s of all time! Shin Min Jun and Shin Jin Seo, promising Korean players (15-16 years and old), show us a new reducing technique. and he seems to be taking his cue from the latter. In the second game of the 53rd Judan title, Ida defeated Takao Shinji Judan (left) by resignation after 220 moves, so he has evened the score in the match at 1-1. Takao fell behind when he missed the best move in a fight: he read a variation out correctly for 17 moves but hallucinated about the result. The game was played on March 26 at the Old Tanaka Family Residence in Kawaguchi City, Saitama Prefecture. This is a three-story Western-style brick house built during the Taisho period (1912-26), with a Japanese-style building, tea house and garden being added later. The whole complex was designated a Nationally Registered Tangible Cultural Asset in 2006. The game was played in the teahouse. The third game will be played on April 9. Yamashita keeps sole lead in Honinbo League: The last game of the sixth round in the 70th Honinbo League was played on March 26. Yamashita Keigo 9P (B, right) beat Ryu Shikun 9P by resignation. He improved his score to 5-1 and hung on to the sole lead. All the games in the final round will be played on April 2. Two other players, Ida Atsushi 8P and Cho U 9P, are on 4-2 and so still have a chance of winning the league. Cho U plays Yamashita in the final round; if Yamashita wins, he becomes the challenger; if Cho wins, he will be tied with Yamashita and could meet him in a play-off. The word is “could,” because if Ida wins his final game against Yo Seiki 7P, creating a three-way tie, only the top two-ranked players qualify for a play-off, which would mean Ida and Yamashita. If a play-off is necessary, it will be held on April 6. Crazy Stone wins computer go tournament: The 8th UEC Cup Computer Go Tournament was held at the Electrical Communications University in Chofu City in Tokyo on March 14 and 15 with 22 programs competing. In the preliminary tournament, the programs that won the 6th and 7th cups, Crazy Stone (developed by Remy Coulom of France) and Zen (developed by Team DepZen of Japan) took first and second place in the seven-round Swiss System preliminary tournament, but Zen suffered an upset loss in the quarterfinals of the knock-out stage. Zen is rated 5- or 6-dan on KGS, but it lost to Nomitan, a Japanese program rated as 2- or 3-dan on KGS. In the final, Crazy Stone beat DolBaram, a Korean program developed by Lim Jae-bum. Two commemorative games were played with Cho Chikun (25th Honinbo Chikun) on March 17. Taking four stones, DolBaram won, but on three stones Zen lost. Trigantius Tournament: On March 7, the Trigantius Tournament was held in the Cambridge University Social Club. Taking the Trigantius Trophy, and his second title since taking up tournament Go at the start of 2015, was London’s Charles Hibbert (3d) with three straight wins. Other three game winners include Alison Bexfield, Yuji Tanaka, Martin Harvey , Philip Smith, Richard Mullens, Fred Zhu, and Ben Murphy. 52 players participated in all.